Participating artists: Dénes Farkas, Jaana Jüris, Neeme Külm, Hanno Soans, Villem Säre, Kirill Tulin, Kadri Villand, Marina Vishmidt, Jevgeni Zolotko. Tallinn Art Hall explained that the exhibition, which lasted for four days, enabled visitors to have the opportunity to peek behind the scenes and see how exhibitions are put together. 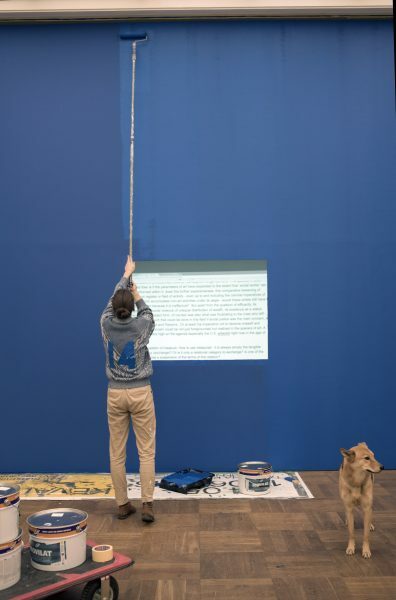 The exhibition project ‘We are about to come up with a title, please bear with us’ brought together the best artists and exhibition installers – often the one and the same person – and allowed them to freely install the exhibition of their dreams without the requirement of it having ever to be finished. Visitors could see the removal of temporary walls, the somewhat monotonous work of calibrating projectors, packing paintings and everything else that usually happens at the Tallinn Art Hall behind closed doors. Visitors were able to witness the constantly-changing space using the same exhibition ticket throughout the duration of the project.